Yesterday a group of scientists led by geologist Dr. Tom Fitz and geochemist Dr. Joseph Skulan hiked to Gogebic Taconite’s proposed Bulk Sampling Site 4 to hold a press conference concerning the deadly asbestos present at the site. Several journalists accompanied the scientists who explained that high levels of the dangerous mineral have been found where GTac has applied for a permit to remove thousands of tons of rock. Fitz, an associate professor of geoscience at Northland College, showed samples of rock from the site that contained the grunerite, one of the deadliest types of asbestos. According to Skulan, who issued this press release earlier in the day, the DNR collected rock at Bulk Sample Site 4 in the spring which was positively identified as grunerite, and the asbestiform crystal habit was confirmed by a scanning electron microscope (SEM) last week. “DNR hydrologist Larry Lynch sent me both reports,” Skulan confirmed. 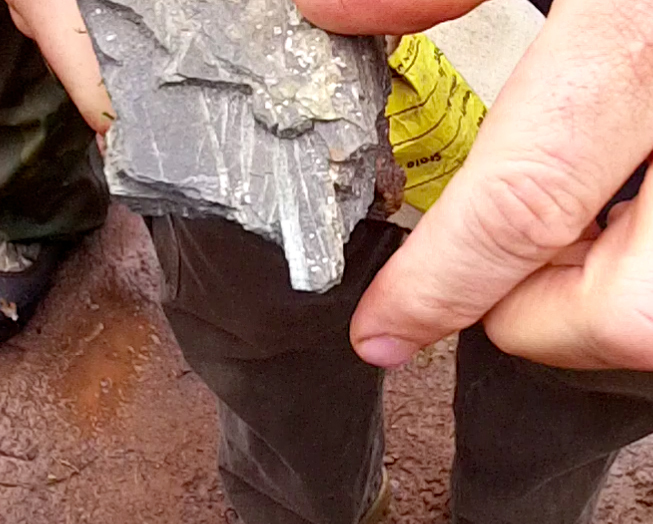 “The stuff we collected is identical to the DNR sample, and is from the same location.” While the presence of grunerite asbestos at Bulk Sample Site 4 was confirmed by the DNR, the high abundance of asbestos at the site has not previously been reported. GTac has yet to respond to the DNR’s August 13, 2013 letter requesting more information. In a press conference broadcast live from the Harvest Education Learning Project, Dr. Skulan stresses the major health risks of asbestos, and Dr. Fitz shows the asbestos under a digital microscope. Seitz: “Prevention is always the answer. That means finding out what is going on. Williams: We don’t need to talk about no stinking asbestos. There are multiple questions that this raises, but the biggest is whether the asbestos that is present is even an issue since asbestos is only problematic for human health if it has sufficient grain length. What sampling methods were used? Can we get samples for independent analysis? I would love to take thin sections of this and put them under the microscope, but the data presented here is insufficient to make a conclusion. Personally I do not think that the GTAC operation is economically viable due to the quantity of overburden that has to be removed to access the ore and the angle of the deposition, but if there is an asbestos issue that must be assessed, but this is not enough information to make an assessment. Did you watch the video? They did do microscope analysis and there is a photo in the video that concludes not only is the grain length long enough to make quite an impact, it is unreasonably long. You are free to do your own analysis I am sure. As someone living under the shadow of this mine, knowing these scientists to be reliable, I would beg to differ on if there is an issue and if this is enough information to determine if there is asbestos. It should force a greater examination by truly unbiased sources, not GTac’s cadre of paid “consultants” who have already lied to us. GTac has claimed there is no asbestos. That alone should be cause for alarm, but then they have gotten away with murder thus far. Why would they tell us the truth at this stage of their racketeering game? I missed the top videos because I usually have flash-block in place to avoid ads when I am on the internet. I was hoping for something a little better than the crumpled up piece of paper though, and also would have to determine if the asbestos is only in one area of the pit or if it is everywhere, the nugget theory of mining. If you download the press release there are images from the DNRs own SEM. Its all there you just have to look for it.